VANCOUVER — Evan Rodrigues has finally relaxed a little bit. That was not easy to do for much of this season. The Buffalo Sabres forward did not have a goal through the first 15 games and had only two through 39 games. Rodrigues was using his speed to earn scoring chances, but puck luck was not on his side. Through it all, the 25-year-old expressed confidence his fortunes would take a turn for the better. Rodrigues has since proven himself right, recording two goals among four points in his past five games. He’s scored in consecutive games, including a breakaway goal in the Sabres’ 4-3 overtime win over the Calgary Flames on Wednesday night in the Saddledome. Rodrigues still has four goals among 15 points with a minus-6 rating in 41 games, falling short of his own expectations for this season. This was supposed to be the year he began making more of an impact offensively. He certainly has the talent to do that. While skating on Jack Eichel’s line, Rodrigues had 21 goals among 61 points in 41 games as a Boston University senior in 2014-15. That would earn Rodrigues a contract with the Sabres, and the team drafted Eichel second overall shortly thereafter. Rodrigues has since struggled to score in the NHL. He has 23 goals among 70 points in 128 career games for Rochester, however, he has only 16 goals in 121 NHL games. That includes seven goals in 48 games with Buffalo last season, a performance that left Rodrigues wanting more. 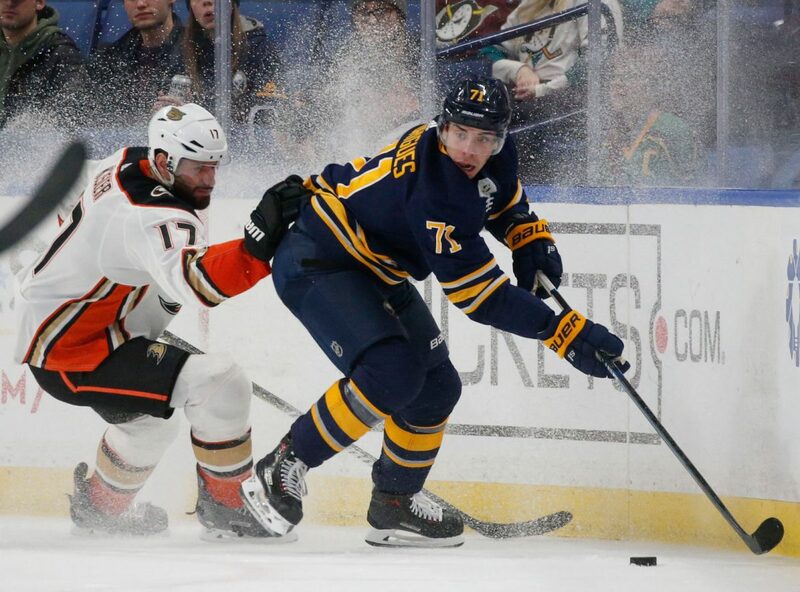 When Eichel missed three-plus games with an upper-body injury this month, coach Phil Housley turned to Rodrigues as the top-line center. Though the assignment did not last long, Rodrigues proved capable of playing with Jeff Skinner and Sam Reinhart. When Patrik Berglund was acquired as part of the Ryan O’Reilly trade, he was supposed to be a versatile forward who could kill penalties, contribute on the power play when needed and help with secondary scoring. Rodrigues has provided everything Berglund could not. Rodrigues is a key cog in the Sabres’ penalty kill, which ranked ninth in the NHL entering Thursday’s games. Rodrigues’ reliability on defense is particularly important given the Sabres’ struggles. Additionally, his work at center has helped strengthened one of the organization’s weaknesses. There are no NHL-ready centers in Rochester, except for Scott Wilson, who was assigned to the Amerks after clearing waivers. This season was also important for Rodrigues because he is a restricted free agent this summer. The Sabres will surely want to see more from him offensively before then. His singular focus is consistency. Like most young players, Rodrigues’ play has admittedly dipped at times since he debuted with Buffalo in 2015-16. Experience taught him how to handle that challenge, as well as the mental anguish of a scoring drought.